When the sets would get built there were too many to display. Then there were what we refer to as “free build” creations from our bins of random LEGOS. After this past Christmas, and birthday a week later, I knew I had to do something different to manage the bricks everywhere in our home. We chose to create a “LEGO Library” with our sets. 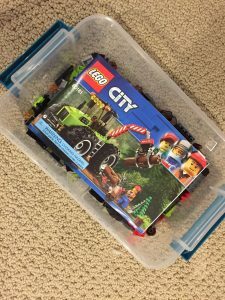 Now when my son gets the urge to build something new, he goes to the LEGO Library, grabs a bin with a LEGO set and corresponding instructions. When he is done with it, it displays for a few days and goes back in the box to be played with again another day. Took apart all the pieces to each built set and put them in the boxes with the corresponding manuals. 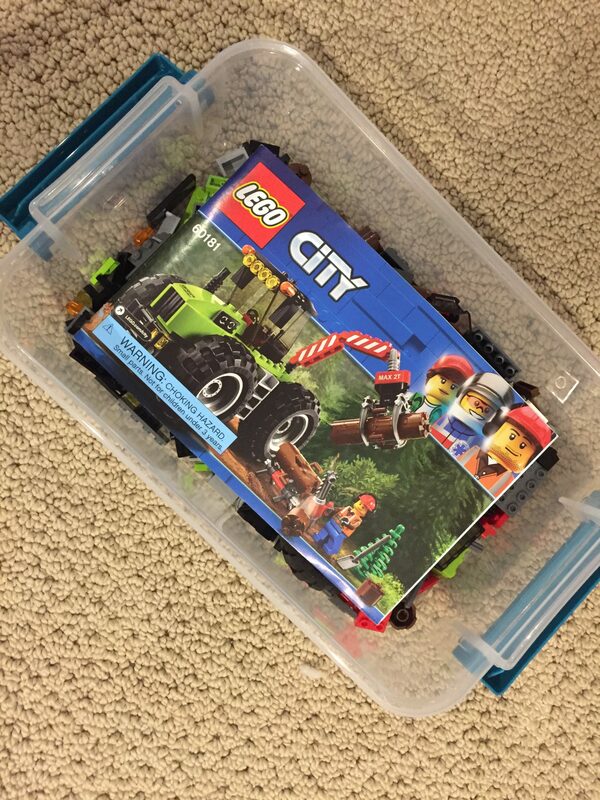 Labeled each box with the LEGO set Number and a short description of the set with a black dry erase marker. Used the back of the LEGO manual with the inventory list to identify any missing pieces. We sorted all of our random LEGO’s by color to make finding missing pieces easier. LEGO groups its inventory sheets by color on the last pages of the manual. 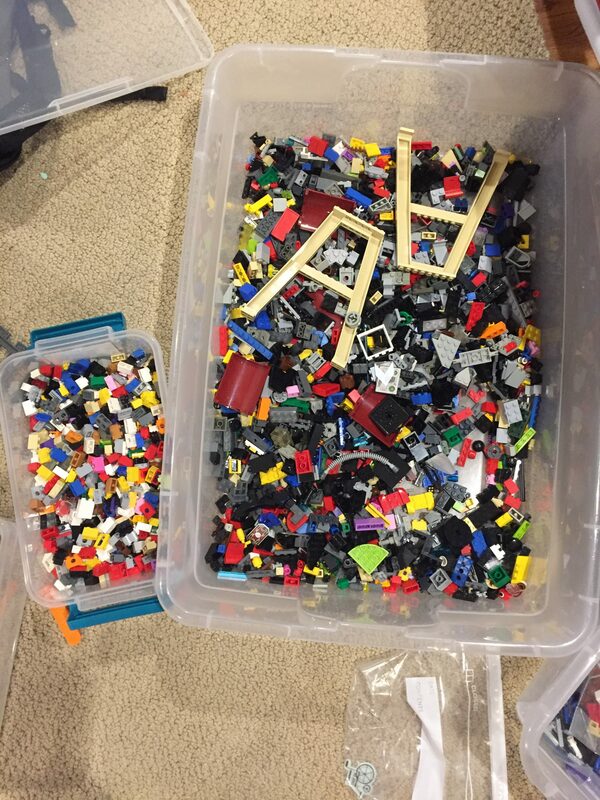 We mixed up all of our random “free build” Legos back into shallow under-the-bed style bins for easy creative play. 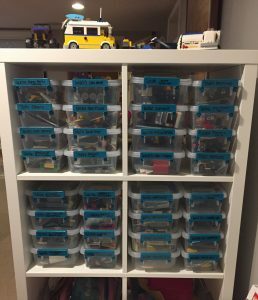 While the Professional Organizer in me wanted to keep them color coded, I am also a realistic parent. We can pick up random LEGOS much faster when there is one place to throw them. Plus, I believe it is much more fun for kids to dig through a pile of LEGOS to find that perfect piece for a creation. We had over 30 sets! It was time to request no more LEGO purchases for our home in the immediate future. Our son loves having his own LEGO area and there is less of an urge to want/need more sets. He takes pride in choosing which LEGO creations he wants to display. Each set is valued as part of a greater collection. Having a bin of LEGOS to make his own creative designs allows him to still dig and discover fun new designs. 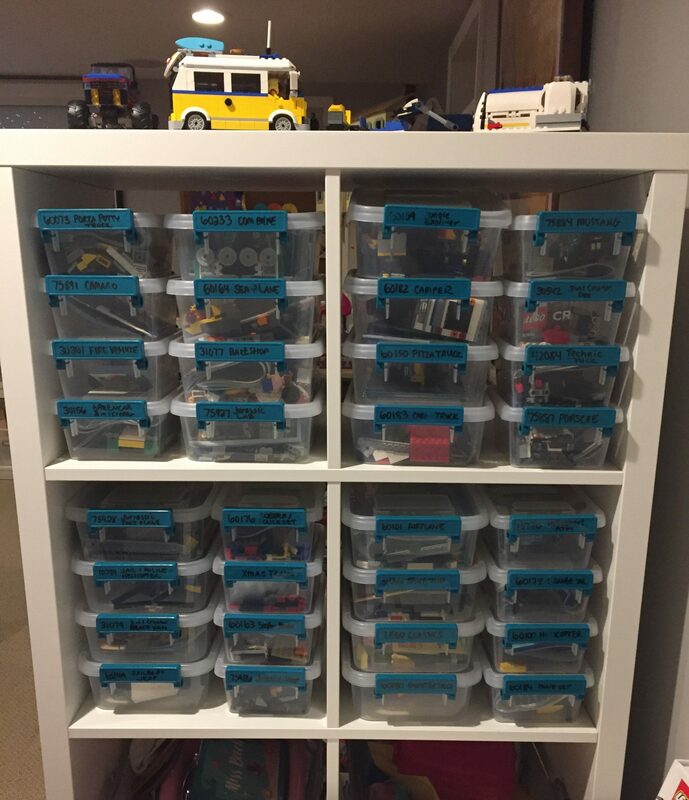 How do you manage LEGO’s in your home? We love to hear your ideas too!